Rene Parker and I enjoyed a delicious lunch at the President's Club Luncheon yesterday. I hope that more of you will be able to join us and be honored for your sales achievements next year. Remember, there are more benefits than just the luncheon to being a PC member, the most important of them being a guaranteed 40% in earnings on all core brochure products and 25% on the fashion and home products for the next year, even if you have smaller orders for some campaigns. You will also be able to earn 45% to 50% if you have large orders, which you cannot do now if you are not in PC. I've posted some pictures from the event on our Cloud Climbers FB page, so be sure to take a look. This campaign was a bit of a slow one, order wise, for me. I'm happy to see that it was not that way for many of you, because nine of the top ten in sales had orders over $150. Yay! I get very excited when I see that eStore sales are building for our team and I'm seeing it a lot lately. In fact, at the PC Tribute for District 1139 yesterday, Rene Parker and I both saw our names on the board for having high eStore sales last year and I am confident we will do even better this year. 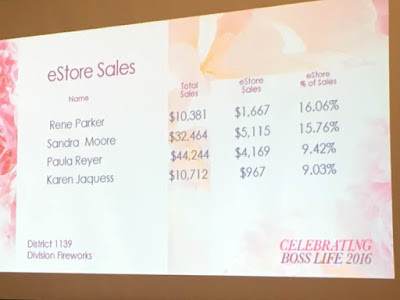 Rene's name is above mine because she had a higher percentage of eStore Sales to Total Sales for the year. She was second for our district in that area, as the Rep. with the highest percentage of eStore Sales was shown on a different slide and received a certificate of recognition. 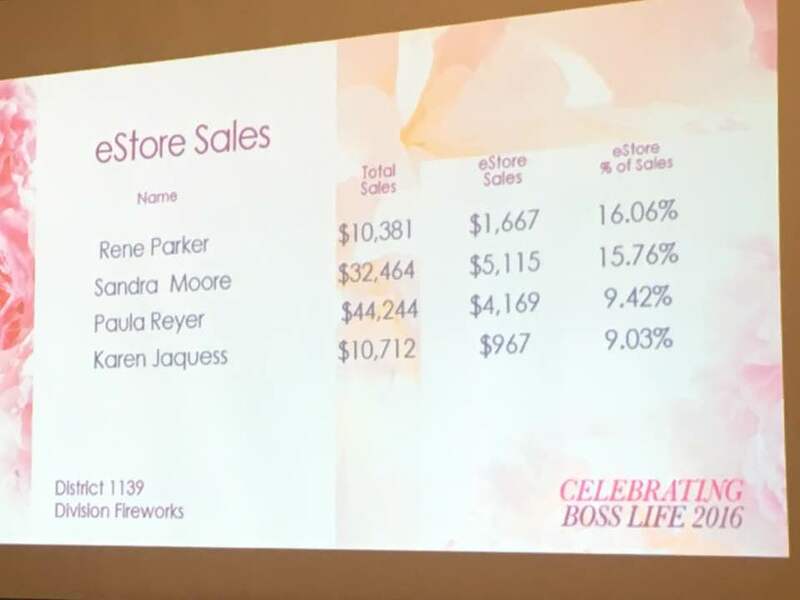 Here are the Top Three in eStore Sales for the Year-to-Date (not including myself): Rene Parker with $339.61, Vallarie Foster with $227.40, and JoAnne Bradford with $181.33. These people had eStore sales in C10: Davacenia Adams, Rene Parker, Wendy Reed, and Sheilia Smith. I'd better finish this newsletter and get myself out of the house, because I want to do some quick book drops for customer search before the school buses start running. It won't be long until I don't have to worry about those bothersome buses, but then I will have to worry about the high heat. 😉 There's always something to interfere with our work if we let it, so let's NOT let it!! Take care, and God bless! I pray for you and the success of your business often. Don't forget that there is still a little more time to earn tickets in the Ticket to Boss Life program and some of the best prizes are still available. Just send me the name of someone you want me to talk to on your behalf about the business and I'll help you get them started so you can earn a ticket or two. Or, just send them to www.startavon.com yourself and make sure they have your reference code to enter where it is required.